The family of Templeton High School football player Isaac Lindsey filed a lawsuit Friday against Templeton Unified School District and Riddell All-American Sports Corp. for failing to properly protect Isaac Lindsey. Lindsey suffered a brain injury during a game at Templeton High School on Sept. 18. An exact cause of the injury was never announced, but Lindsey was involved in at least three helmet-to-helmet hits during the game. A few plays following the final helmet-to-helmet hit and requests by the player for a substitution, Lindsey collapsed on the field. Emergency personnel transported him to Sierra Vista Regional Medical Center in San Luis Obispo, where he spent several days in critical condition. In the suit, Isaac Lindsey’s mother Jennifer Lindsey claims that school officials failed to follow proper protocol after the helmet-to-helmet hits and her son’s collapse. In addition, the lawsuit claims that Isaac Lindsey’s helmet, manufactured by Riddell, was defective and did not provide the proper protection. As a result of his injury, Isaac Lindsey is physically and mentally impaired, according to the lawsuit. The suit is seeking unspecific damages regarding the injury and emotional distress. 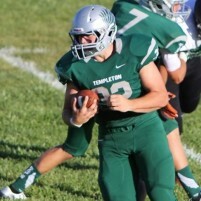 This lawsuit could be the death knell for high school football at Templeton. The CDC actually has a head injury protocol. If TUSD did not follow it, they will have to answer for it. As for the student sitting at the games up close, I don’t know what ED Code laws apply. If his doctor(s) cleared him to be there, I don’t think the school CAN ban him from a “school sponsored event”. TUSD might be liable for student’s future loss of income and medical bills. If he is unable to work now, the jury might calculate out that he would earn 35k a year or something and apply it over his “working life” to 55 or something. I’m not a lawyer. The sister, well it SEEMS like a far stretch that she should be compensated. Maybe the law says otherwise.